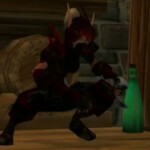 This one’s an old favorite and is one of the best machinima ever done for WoW. Put together in 2008, by a fellow who’s pretty much disappeared since (sob) it stands the test of time very well. As far as I know, he originally had plans to do other videos, but has apparently moved on to whatever else he’s doing.